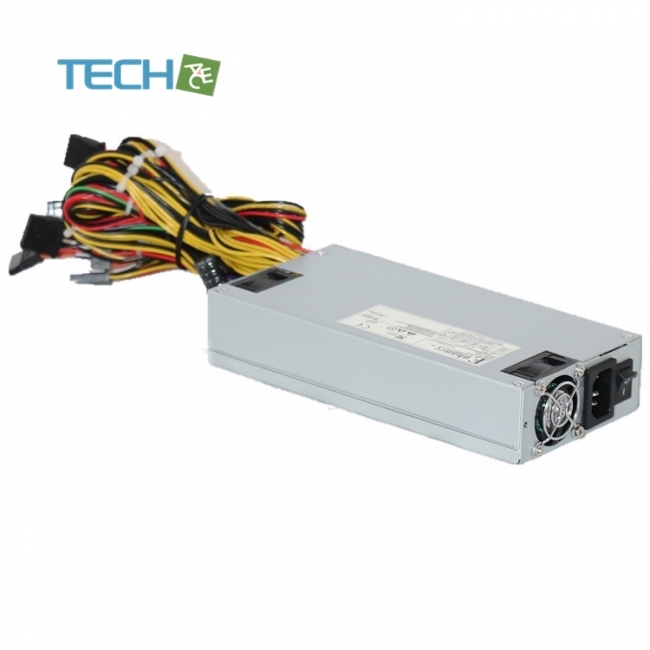 This specification describes the requirements of 600 Watts switching power supply with an stretch ATX form-factor and EPS 12V, +5V standby voltage, remote on/off control, full range line input capability and forced air cooling characteristics. The input voltage, current, and frequency requirements for continuous operation are stated below. Power factor correction (PF)>0.90 at full load. The power supply must meet inrush requirements for any rated AC voltage, during turn on at any phaseof AC voltage, during a single cycle AC dropout condition, during repetitive ON/OFF cycling of AC,and over the specified temperature range (Top). The peak inrush current shall be less than the ratingsof its critical components (including input fuse, bulk rectifiers, and surge limiting device). 1.Maximum continuous total DC output power should not exceed 600W. 2.Maximum continuous combined load on +3.3VDC and +5VDC outputs shall not exceed 130W. 3.Maximum combined current for the +12V outputs shall be 50A(600W). 4.When -12V is load to 0.3A , +12V minimum load is 2A. The ripple voltage of the outputs shall be measured at the pins of the output connector when terminated in the load impedance specified in figure 1. Ripple and noise are measured at the connectors with a 0.1uF ceramic capacitor and a 10uF electrolytic capacitor to simulatesystem loading. Ripple shall be measured under any condition of line voltage, output load, linefrequency, operation temperature. Any overshoot at turn on or turn off shall be less 10% of the norminal voltage value, all outputs shall be within the regulation limit of section 2.0 before issuing the power good signal of section 5.0. The power supply efficiency typical 87% at normal input voltage and meet the ERP2013. When the logic level "PS-ON" is low, the DC outputs are to be enabled. When the logic level is high or open collector, the DC outputs are to be disabled. The power supply shall have current limit to prevent the +3.3V,+5V,and +12V, outputs from exceeding the values shown in the following Table. If the current limits are exceeded the power supply shall shutdown and latch off. The power supply will be protected against over temperature conditions caused by loss of fan cooling or excessive ambient temperature. In an OTP condition the PSU will shutdown. When the power supply temperature drops to within specified limits, the power supply shall restore power automatically. The OTP circuit must have built in hysteresis such that the power supply will not oscillate on and off due to temperature recovering condition. 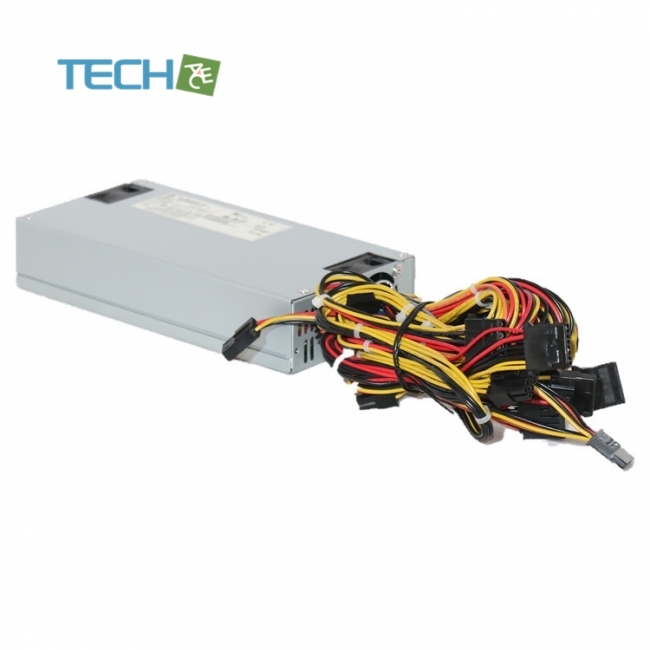 The power supply will be shutdown and latch off when output power within 110~180% of rated DC output. Note: Assurance machine can work at low voltage, full load won't damage machine. In an under voltage fault occurs, the supply will latch all DC outputs into a shutdown state when +12V,+5V & +3.3V outputs under 85% of it's maximum value. The over voltage sense circuitry and reference shall reside in packages that are separate and distinct from the regulator control circuity and reference. No single point fault shall be able to cause a sustained over voltage condition on any or all outputs. The supply shall provide latch-mode over voltage protection as defined in Table. No damage or hazardous condition should occur with all the DC output connectors disconnected from the load. The power supply may latch into the shutdown state. Relatively moderate 5 to 90%, Non state. Application Server workstation industrial storage etc.